Many were quick to point out that Haspel being a woman has nothing to do with whether she is suitable to lead the CIA, and that what’s more important is her record. “It’s probably possible to simultaneously ‘support women’s empowerment’ and oppose the empowerment of torturers (male or female),” journalist Glenn Greenwald responded. What if you just oppose torture? 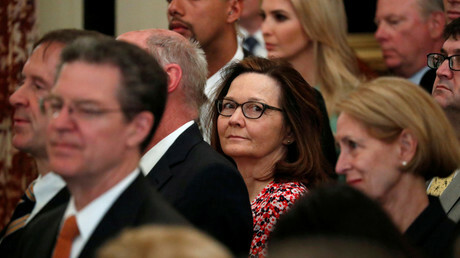 Haspel, who worked in counterterrorism at the time, is also accused of being involved in the order to destroy 92 tapes of evidence of the CIA’s use of torture on detainees. Her name appeared on the 2005 cable ordering the destruction of the tapes. In response to recent outrage over Haspel’s role in the destruction of evidence, the CIA declassified a 2011 memo which cleared Haspel of any fault and appointed blame on the head of the CIA’s clandestine service at the time. Haspel’s role in the George W. Bush-era extraordinary rendition and torture program caused a number of Democrats, and Republican Rand Paul, to protest her nomination to the head of the CIA. Over 100 retired military leaders penned a letter to the Senate voicing their concerns about her nomination, as did more than 60 rights groups. Sanders’ tweet backing Haspel’s nomination for CIA chief was reminiscent of former Secretary of State Madeleine Albright’s ominous warning that there was “a special place in hell” for women who didn’t vote for Hillary Clinton during the 2016 election. I mean wtf Sarah. Can u not see the hypocrisy of ur argument here? HRC was also “the most qualified candidate”. Didn’t see you backing HER for POTUS, based on some BS female empowerment theory. While some Democrats remained loyal to their candidate at least in part because of the possibility of her becoming the first female president of the US, others felt affronted by the idea they should cast their vote for a candidate simply because of her gender rather than her record. Sanders herself received criticism for calling Democrats hypocrites, given the fact that her gender didn’t compel her to vote for Clinton in 2016, and in light of her own position as spokesperson for a man accused of sexual assault and sexism. You lost the authority to speak about women’s empowerment when you started lying for a guy who values women based on their looks, if at all. Seriously, give us a break! Sanders’ ill-received statements echo the administration’s efforts to paint Haspel’s career as one filled with glass ceiling-shattering moments, as suggested in a glowing statement published on the White House website this week.